The massively popular Spelunky has been remade in delicious 1080p-ness for the XBox and PC. 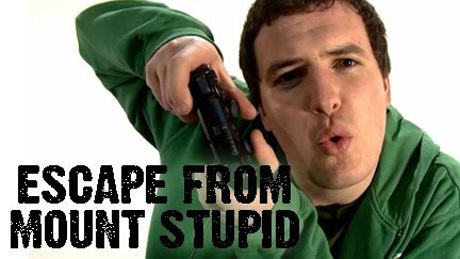 If that piques your interest then sit back and let DogVom walk you through the game as he gives it one of his patented YouBigNonce reviews. Dogbomb is back with another of his awesome reviews. For a change though, this one isn’t just one game. He’s reviewing a hundred and one of the best games from the Ludum Dare game making competition. Don’t worry though, each review is kept short and hilarious. Some retro platforming insanity that’s available for Pc and iPhone, as reviewed by and excitable geordie. We take Lightning McQueen for a spin around the tracks in Disney Interactive’s game based on Pixar’s animated film of the same name. As far as film-to-video game adaptations go, those based on Pixar’s animated works are on the more easily digestible end of the scale. With Pixar’s Cars 2 set for release later this year, Disney Interactive has knocked up a colourful arcade driving game based on the film, for ages 5 and up. We recently had the chance to sit down with a small demo of a very early build of the game. At this stage, all the cutscenes we saw were still in the early stages of development (read: slow-moving drawings). but even though this is not what the final game will look like, it added a light and cartoony feel to the whole demo. Little is known about the story so far, but it looks like it will closely follow that of the film. 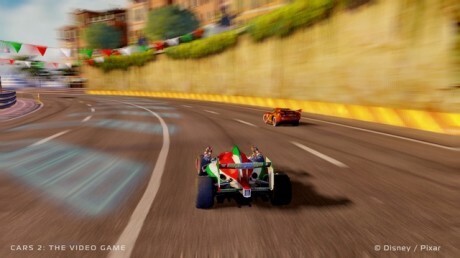 Because the main campaign is still being worked on, we were shown a few training missions from the start of the game, which are designed to get you acquainted with the different aspects of gameplay and the racing tracks in the game. There’s an underlying spy theme running through the whole game, and so our first training mission took place in spy school. After picking from a variety of characters (Lightning McQueen, Finn, Sarge, Mater, and so on), we were shown a basic training mission that involves learning the controls of the game–steering, doing jumps and tricks, drifting, boosting, and so on. Completing the missions well earns you points, which fill up an experience meter that can be used to unlock new missions and car skins. The best part about this bit was hearing actor Michael Caine’s voice giving curt, beautifully sarcastic instructions. In Bulletstorm, you earn points by kicking your enemies into cacti, shooting them in the rear end, and flinging them into the air with your electric leash, among many other variations and combinations of bullets, boots, and exploding barrels. You spend these points on ammo, weapon upgrades, and more, giving you reason to perform these moves beyond the initial gratification they provide. Bulletstorm is sometimes ludicrous and often ludicrously fun–an enjoyable and occasionally embarrassing journey to the profane future it predicts. The Confederation of Planets’ General Sarrano is a product of this future. This potty-mouthed, wholly abhorrent man is part of a secret army called Dead Echo–as was Grayson Hunt, a grunt who discovered that the targets that Sarrano ordered his team execute were innocent of wrongdoing. Years later, a drunken Grayson, thirsty for revenge, leads his crew of mercenaries into a battle they’re ill-prepared to win. Grayson and Sarrano both crash-land on the planet Stygia, where Grayson’s quest for vengeance is coupled with his plan to escape. As Grayson, you are accompanied by Ishi, a colleague constantly fighting to control the robotic AI used to patch his brain after he’s injured during Grayson’s alcohol-fueled rampage. Ishi is Bulletstorm’s best character: conflicted, temperamental, and unpredictable. Nevertheless, praising any of this game’s characters is somewhat of a backhanded compliment, given their shallow penchant for describing events, emotions, and each other using four-letter words combined in various nonsensical ways. 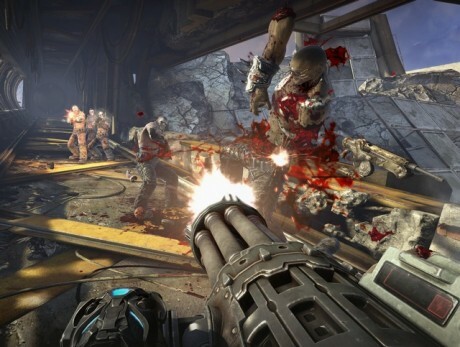 A few of these bizarre outbreaks of sexual innuendo might be absurd enough to put a momentary grin on your face, but the cringe-worthy dialogue isn’t coupled with, say, Duke Nukem 3D’s hysterical hypersexual excess, Serious Sam’s vibrant surreality, or Vanquish’s tongue-in-cheek skewering of modern video game machismo. In fact, Bulletstorm’s finest narrative moments are those that leave the trashy talk behind and touch ever-so-briefly on Grayson’s guilty conscience, and his attempts to help Ishi conquer the AI infesting his mind. Unfortunately, the verbal sleaze gets tiring quickly and undermines any attempt at serious storytelling. Perhaps developer People Can Fly meant for this dialogue to be so over the top as to be side-splittingly funny. Instead, it comes across as a forced attempt to appeal to our basest instincts. 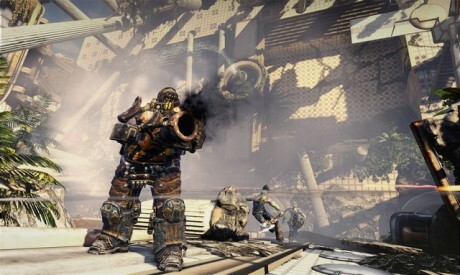 And so Bulletstorm lacks wit, but it has no shortage of entertaining, in-your-face action. The six-hour campaign is packed with fun shooting made even more enjoyable by the way you earn rewards for being awesome. Your awesomeness begins with the energy leash, which lets you grab foes from afar and yank them toward you. Doing so causes them to helplessly hover in the air for a few seconds as if the laws of time and gravity were temporarily suspended just for that particular enemy.